Spanish Royal Family is in Mallorca for summer break. Yesterday we saw Queen Letizia having a girls day out with her daughters and Mother-in-Law, tonight King Felipe took out the whole family out to the concert of the violinist Ara Malikian at Porto Adriano. The Family of four was joined by Felipe’s Mother Queen Sofia, his sister Infanta Elana also. After the rumors of hard feelings among the family members, the vacations and outing are proving all those rumors to be what they are – rumors only. 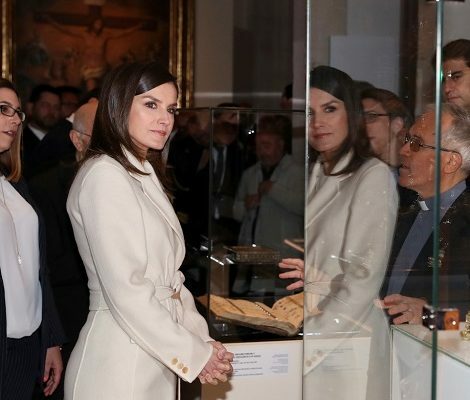 Coming to Queen’s sartorial details, Letizia was dazzling in monochrome outfit. She was wearing white silk camisole that is yet to be unidentified. She paired the camisole with silk black pants that she premiered during last year’s vacation. It’s label is unidentified. Letizia brought back her black Naguisa braided sandals that she debuted during a visit to Tenerife to open the academic session of 2017-2018. Her white gold and diamond large earrings that are part of her wardrobe since 2008 finished the look. Queen was carrying black satin hand bag that is a new addition to her wardrobe. The label of the handbag is yet to be identified.